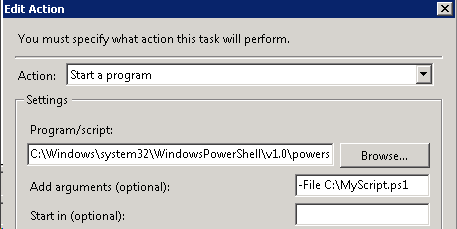 Traditionally Windows administrators is used to work with the Windows Task Scheduler using the command line utilities at.exe and schtasks.exe. Schtasks.exe was introduced as a replacement for at.exe in Windows XP/Windows Server 2003, while at.exe still exists in the latest Windows versions for backwards compatibility. To make this utilities behave more PowerShell friendly we could create custom functions which for example wraps schtasks.exe /create in a New-Task function, but still it would require a lot of work to parse the text output into custom objects. By using this COM-object we can access the Task Scheduler Scripting Objects, which produces objects rather than text. Of course this still requires a bit of work and the need to read quite a bit of documentation in order to make it user friendly for an administrator. 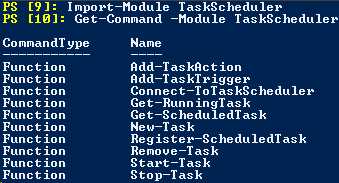 Luckily the PowerShell team released a TaskScheduler module which builds on this COM-object as part of the PowerShell Pack, released as part of the Windows 7 Resource Kit. 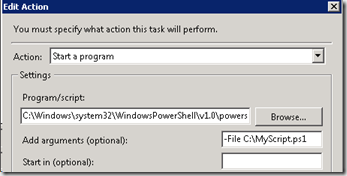 Add-TaskAction -Task $task -Path C:Windowssystem32WindowsPowerShellv1.0powershell.exe -Arguments "-File C:MyScript.ps1"
Add-TaskTrigger -Task $task -Daily -At "06:00"
An advantage of this approach is that we do not need to save our code to disk in advance to configuring it as a scheduled task. With the new version of Windows coming out later this year, we will also get a new version of Windows PowerShell. One of the new features in PowerShell 3.0 is a new module called PSScheduledJobs, which allows us to schedule jobs natively from within PowerShell. In addition, the output and results from the job is actually stored so that we can retrieve them after the job is executed, just like we could with background jobs in PowerShell 2.0. The following information and examples is based on the Windows PowerShell 3.0 version available in the Windows 8 Consumer Preview. $trigger = New-JobTrigger -Daily -At "06:00"
To read about the reason for this in addition to more details about the new module you can read the “Scheduling Background Jobs in Windows PowerShell 3.0” article on the Windows PowerShell Team Blog.